INFORMACION NACIONAL. VACACIONES DE LA REINA FABIOLA. LLEGADA A FUENTERRABIA. FRANCO VISITA LA FERIA-EXPOSICION DE FERROL. INDUSTRIA NAVAL Y MUESTRAS DEL NOROESTE. REFLEJOS DEL MUNDO. BARCOS EN CONSERVA PUESTOS A PUNTO. ACTIVIDAD EN LOS ASTILLEROS DE SAN FRANCISCO. EL SECRETARIO DE DEFENSA DE ESTADOS UNIDOS EN SAIGON. CONVERSACIONES CON LOS JEFES VIETNAMITAS. DEPORTES. FINAL EUROPEA DE LA COPA DAVIS. ENCUENTRO DE INDIVIDUALES, EN BARCELONA. TOROS. FRANCO PRESIDE LA CORRIDA DE FERIA EN CORUÑA. ACTUACION DE CURRO ROMERO, EL CORDOBES Y MANUEL AMADOR. ACTUALIDAD NACIONAL. EL JEFE DEL ESTADO FRANCISCO FRANCO INAUGURA EL MUSEO DE AMERICA EN MADRID. CON MOTIVO DE LA CELEBRACION DEL 18 DE JULIO FRANCO PONE EN MARCHA A DISTANCIA DESDE EL PALACIO DE EL PARDO NUEVAS EMISORAS DE RADIO Y TELEVISION. EL BAILE DE LAS DEBUTANTES EN EL PALACIO DE BAVIERA EN MADRID. UNA BRILLANTE FIESTA SOCIAL. LA ESTACION DE ROBLEDO DE CHAVELA RECIBE LAS PRIMERAS FOTOGRAFIAS DE MARTE TRANSMITIDAS POR EL "MARINER IV". INFORMACION NACIONAL. FRANCO INAUGURA NUEVOS EDIFICIOS SANITARIOS. LA RESIDENCIA MATERNAL Y LA CLINICA INFANTIL LA PAZ. EL JEFE DEL ESTADO INAUGURA EL CENTRO DE FORMACION PROFESIONAL ACELERADA EN MADRID Y EN ESTE CENTRO SE ENTREGAN LOS PREMIOS NACIONALES DE TRABAJO. CONCURSO NACIONAL DE DESTREZA MARINERA EN EL PARQUE SINDICAL DE MADRID. LABOR DEL PATRIMONIO NACIONAL. EL PALACIO DE RIOFRIO CONVERTIDO EN MUSEO, ASISTE A SU INAUGURACION ENTRE OTRAS AUTORIDADES POLITICAS EL MINISTRO DE INFORMACION Y TURISMO MANUEL FRAGA IRIBARNE . LA PRINCESA SORAYA EN LA COSTA DEL SOL. ASALTO DE LOS FOTOGRAFOS A SU POPULARIDAD. ACTUALIDAD ESPAÑOLA. EL 18 DE JULIO EN LA GRANJA. FRANCO Y SU ESPOSA CARMEN POLO PRESIDEN LA RECEPCION EN HONOR DEL GOBIERNO Y CUERPO DIPLOMATICO. HOMENAJE A LA MODA ESPAÑOLA EN EL RETIRO. ASUNCION BASTIDA Y PEDRO RODRIGUEZ RECIBEN LA PLACA AL MERITO TURISTICO DE MANOS DEL MINISTRO DE INFORMACION Y TURISMO FRAGA IRIBARNE. JURA DE BANDERA EN VILLAFRIA (BURGOS). ES MADRINA DE LA PROMOCION LA PRINCESA SOFIA QUE ASISTE A LA JURA CON SU ESPOSO EL PRINCIPE JUAN CARLOS.. UN TORO INDULTADO EN LA PLAZA DE TOROS DE MARBELLA (MALAGA) PETICION DEL CORDOBES. "COSTURERO" CONVALECE DE SUS HERIDAS DE LA LIDIA. INFORMACION NACIONAL. EL HOSTAL DE SAN MARCOS DE LEON. INAUGURACION POR S.E. EL JEFE DEL ESTADO. PLS MANUEL FRAGA (MINISTRO DE INFORMACION Y TURISMO) JUNTO AL PRESIDENTE DEL INI RECORDANDO LA HISTORIA DEL EDIFICIO. POSTERIORMENTE FRAGA, ALABARA LA LABOR DE CONSTRUCCION. PLS DIRIGENTES POLITICOS VISITANDO EL HOSTAL. UN NUEVO COCHE DE TURISMO ESPAÑOL. EDUARDO BARREIRO (EMPRESARIO) GUIA EN LA INAUGURACION AL MINISTRO DE INDUSTRIA POR LA CADENA DE FABRICACION. EN LA PLAYA DONOSTIARRA DE LA CONCHA. CONCURSO DE CASTILLOS EN LA ARENA. INAUGURACION DE OBRAS PUBLICAS EN MADRID. LA CALLE DE ALFONSO XII Y EL TUNEL DE MARIANO DE CAVIA. DEPORTES. PRUEBAS DE MOTONAUTICA EN EL PUERTO DE ALICANTE. CAMPEONATOS DE ESPAÑA Y EUROPA DE ESTA ESPECIALIDAD. CONCURSO HIPICO EN AQUISGRAN. PREMIO COMPARTIDO ENTRE EL ITALIANO D'INZEO Y EL ARGENTINO ARRAMBIDE. REFLEJOS DEL MUNDO. TUNEL BAJO EL MONT BLANC. LOS PRESIDENTES DE GAULLE Y SARAGAT, INAUGURAN LA NUEVA RUTA SUBTERRANEA. DE PISANELLO A REMBRANDT. DIBUJOS DE GRANDES MAESTROS EN EL MUSEO ALBERTINA DE VIENA. FIN TRAGICO DE UN DOBLE DE CINE. LA ULTIMA ACROBACIA AEREA DE PAUL MANTZ. INFORMACION NACIONAL. S.E. EL JEFE DEL ESTADO EN SANTIAGO DE COMPOSTELA. LA OFRENDA AL APOSTOL. HALLAZGOS ARQUEOLOGICOS EN BARCELONA. EXCAVACIONES EN LA MURALLA ROMANA. 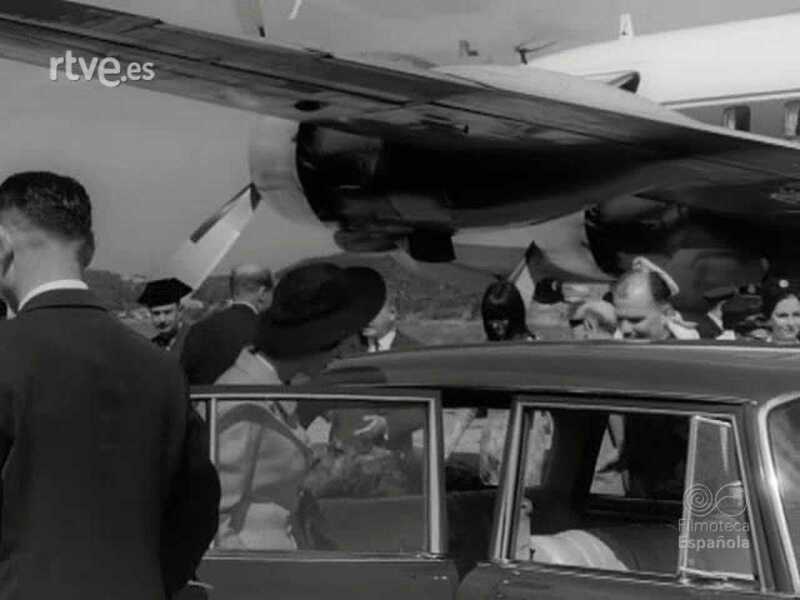 LOS COROS Y DANZAS DE ESPAÑA EN BARAJAS. A SU REGRESO DE LA FERIA MUNDIAL DE NUEVA YORK. DEPORTES. GRAN PREMIO MOTORISTA DE BELGICA. EL INGLES MIKE HAILWOOD, TRIUNFADOR EN LOS 500 C.C. EL "KARATE" HACE PROGRESOS. AUSTRIA, GANADA POR EL NUEVO DEPORTE. DEPORTE Y MULTITUDES. LAS AGLOMERACIONES EN LA VIDA MODERNA. REFLEJOS DEL MUNDO. COMPROMISO MATRIMONIAL DE LA FUTURA REINA DE HOLANDA. BEATRIZ Y CLAUS VON AMSBERG, ACLAMADOS EN LA HAYA. ALPINISTAS DE CATEDRALES. RESTAURACION DE SAN ESTEBAN, DE VIENA. NOTICIAS ESPAÑOLAS. FRANCO VISITA EL BURGO DE LAS NACIONES EN SANTIAGO ACOMPAÑADO DE LOS MINISTROS DE LA VIVIENDA, GOBERNACION, INFORMACION Y TURISMO - MANUEL FRAGA IRIBARNE- Y DEL MOVIMIENTO. ALOJAMIENTO PARA 4000 PEREGRINOS. SALIDA A LA SUPERFICIE DEL ESPELEOLOGO MIGUEL MATAIX. VENTIUN DIAS EN UNA CUEVA BAJO TIERRA AISLADO DEL MUNDO. FESTIVALES DE ESPAÑA EN CASTELLDEFELS. ACTUACION DE LA PAREJA ARTISTICA ANTONIO Y ROSARIO. DEPORTES. EL "LE MANS" DE LOS "GO-KARTS". PRUEBAS SOBRE EL CIRCUITO DE VIENA. CARRERA INTERNACIONAL DE TROTONES EN NUEVA YORK. VICTORIA INESPERADA DEL SUECO "PLUVIER III". LOS TURISTAS SE DIVIERTEN. EXPANSIONES TAURINAS DE VERANO EN CANET DE MAR. UNA CORRIDA CON "LIDIADORES" EXTRANJEROS. ACTUALIDAD NACIONAL. JORNADA HISTORICA EN LA UNIVERSIDAD DE SANTIAGO. FRANCO, DOCTOR "HONORIS CAUSA" DE LA FACULTAD DE CIENCIAS COMPOSTELANA. INFORMACIONES Y REPORTAJES. CONSERVACION DE FRUTAS. UNA FORMULA MAGICA DE DIEZ SEGUNDOS. AEROMODELISMO TELEDIRIGIDO. COMPETICION EN SALZBURGO. HABILIDAD CIRCENSE. CONJUNTO HUNGARO EN SU GIRA POR EUROPA. DEPORTES. V ENCUENTRO INTERNACIONAL DE NATACION FEMENINA ITALIA-ESPAÑA. BRILLANTE ACTUACION DE LA ESPAÑOLA ISABEL CASTAÑE. FINAL EUROPEA DE LA COPA DAVIS, EN BARCELONA. PARTIDO DE "DOBLES": ESPAÑA-AFRICA DEL SUR. INFORMACIONES Y REPORTAJES. PLANTACIONES EN LERIDA. EXPORTACION DE FRUTAS SELECTAS. LAS PRIMERAS FOTOS DE MARTE. PRESENTACION EN EL LABORATORIO DE PASADENA. COMPETICION DE HIDROS EN MINIATURA, EN ALEMANIA. TRIUNFO DEL BERLINES WILLY TIEDE. DE LAS SOMBRAS CHINESCAS A LAS "FANTASMAGORIAS". EXPOSICION EN PARIS. DEPORTES. XXXV TRAVESIA A NADO DE LA LAGUNA DE PEÑALARA. SEBASTIAN ESCUDERO, VENCEDOR ABSOLUTO MASCULINO. PRUEBA DE "LAS TRES MILLAS" EN LONDRES. RON CLARKE, VENCEDOR Y RECORDMAN DE LA COMPETICION. FESTIVAL DE BENIDORM. "TU LOCA JUVENTUD", PRIMER PREMIO. SU INTERPRETE, FEDERICO CABO RECOGE SU TROFEO. REFLEJOS DEL MUNDO. NUEVO EMBAJADOR DE ESTADOS UNIDOS EN LA ONU. MR. GOLDBERG JURA EL CARGO. LA BICICLETA, COMPLEMENTO DEL AUTOMOVIL. VIAJE POR LAS CALLES DE LONDRES. DEPORTES. COMPETICION ATLETICA EN BERLIN. CAMPEONES OLIMPICOS FRENTE A FRENTE. INFORMACION NACIONAL. BATALLA DE FLORES EN VALENCIA. EN EL "DIA DEL TURISTA". JUSTAS MEDIEVALES EN COMPOSTELA. TORNEOS CABALLERESCOS AL ESTILO ANTIGUO. VI FESTIVAL HISPANO-PORTUGUES DE LA CANCION DEL DUERO. "MARIOLA", PRIMER PREMIO, POR FRANCISCO HEREDERO. INFORMACION NACIONAL. MONUMENTO AL GAITERO GALLEGO. INAUGURACION EN RIBADEO POR PARTE DE MANUEL FRAGA IRIBARNE (MINISTRO DE INFORMACION Y TURISMO). DEPORTISTAS PARALITICOS NORTEAMERICANOS. DEMOSTRACION ATLETICA Y DE JUEGOS EN MADRID. TOROS. CORRIDAS DE LA FERIA MALAGUEÑA. FAENAS DE LOS GRANDES MAESTROS. INFORMACIONES Y REPORTAJES. ELECCION DE "MISS UNIVERSO". LA REPRESENTANTE DE THAILANDIA, NUEVA REINA. LA PAZ E INDEPENDENCIA DE VIETNAM. SERIA ADVERTENCIA DEL PRESIDENTE JOHNSON. APRENDIENDO A NAVEGAR. ALUMNOS DE LA ESCUELA ALEMANA DE GLUCKSBURG. ACTUALIDAD NACIONAL. EL SUBSECRETARIO DE INFORMACION Y TURISMO EN BUENOS AIRES. EL SR. CABANILLAS FIRMO UN CONVENIO DE INTERCAMBIO. ADQUISICION DEL ZOO BARCELONES. CUATRO DELFINES AMAESTRADOS. DEPORTES. GRAN PREMIO AUTOMOVILISTICO DE ALEMANIA. JIM CLARK TRIUNFADOR EN NURBURGRING. XXXV CAMPEONATOS CASTELLANOS DE NATACION. DOBLE TRIUNFO DEL REAL MADRID. INFORMACIONES Y REPORTAJES. BODA DEL ALCALDE DE NUEVA YORK. EL CARDENAL SPELLMAN BENDICE LA UNION. LA FLOTA NORTEAMERICANA EN EL MEDITERRANEO. EL PORTAVIONES "RANDOLPH" EN EJERCICIOS ANTISUBMARINOS. ACTUALIDAD NACIONAL. LA NAO "OLATRANE" DISPUESTA PARA ZARPAR. ALEGRIA A BORDO CON LOS ULTIMOS PREPARATIVOS. CAMPEONATO DE EUROPA DE ESQUI NAUTICO EN BAÑOLAS. PRUEBAS DE SLALOM Y SALTOS. INFORMACIONES Y REPORTAJES. LAVACOCHES AUTOMATICO. EL COCHE, LIMPIO EN CUATRO MINUTOS. RETRATOS DE PERSONALIDADES ESPAÑOLAS EN NUEVA YORK. EXPOSICION EN EL PABELLON DE LA FERIA. ESCUELA HOLANDESA DE BOMBEROS. ESPECTACULARES DEMOSTRACIONES CON ESPUMA. NUEVA VIVIENDA PARA LOS BUITRES. AMPLIACIONES EN EL ZOO DE BERLIN. INUNDACIONES EN VARSOVIA. MARATON BAJO LA LLUVIA. ENTRE ESCENA Y ESCENA DE UN RODAJE. EL PASATIEMPO DE ALBERTO CLOSAS. ACTUALIDAD ESPAÑOLA. LA MODA EN SAN SEBASTIAN. II SALON INTERSINDICAL DE LA ELEGANCIA. SARDANISTAS EN S'AGARO. RITO Y BELLEZA DE LAS VIEJAS DANZAS. CAMPEONATO DE BURROS EN LLODIO, ALAVA. PIENSO PARA EL VENCEDOR: "ANQUETIL". INFORMACIONES Y REPORTAJES. INCENDIO APAGADO EN DIEZ SEGUNDOS. NUEVO COCHE-EXTINTOR NORTEAMERICANO. LABORATORIO FLOTANTE DE "HOVERCRAFT". ENSAYO DE NUEVOS MODELOS. ESCUELA DE INVIDENTES EN MARLY. METODOS DE CAPACITACION Y REEDUCACION. ACTUALIDAD NACIONAL. FRANCO INAUGURA EN CORUÑA UNA LINEA TELEFONICA CON CANARIAS. CONSEJO DE MINISTROS EN EL PAZO DE MEIRAS. FESTIVAL DE VALLDEMOSA. EL RECUERDO DE FEDERICO CHOPIN. REFLEJOS DEL MUNDO. JOYERIA ESPAÑOLA EN NUEVA YORK. EXPOSICION Y VENTA EN LA CIUDAD DE LOS RASCACIELOS. CAZA DE MARIPOSAS. UNA COLECCION DE CUATRO MIL EJEMPLARES. SUBMARINO DE BOLSILLO PARA EXPLORACIONES. PRUEBAS EN LAS BAHAMAS. OPERADORES DE CINE EN EL "CAMPO DEL HONOR". DUELO CON CAMARAS TOMAVISTAS. DEPORTES. IV TROFEO ZARIQUIEGUI, DE PATINAJE. PRIMITIVO ASENJO, VENCEDOR EN PAMPLONA. A TRAVES DE LA CORTINA DE CENIZAS. ACCIDENTADA PRUEBA EN LA PISTA DE OLCHING.